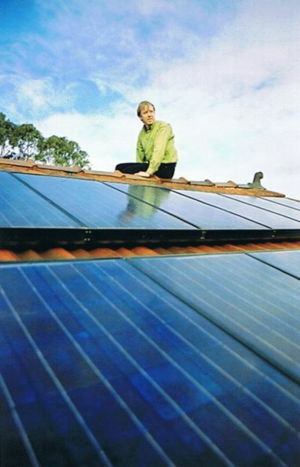 Stuart McQuire's home in West Brunswick was the first in Victoria and the second in Australia to feed energy it created into the state's power grid. Since 1996 the house has has generated more electricity than it has used. After an outlay of $5000, Stuart hasn't paid an electricity bill. Reduction of greenhouse emissions by over 90% since 1994. Home office efficient computers and printers. Productive permaculture style garden, about 20 fruit and nut trees, seasonal vegetable garden. Indigenous, native and low water plants. Gas space heating zoned to living areas. Cellulose insulation in ceiling - R 2.5 plus AirCell insulation in ceiling. Four rain water tanks, total of 20,300 litres, used for all water, plus cold water for showers, laundry & garden. Envirowater water treatment system. Bladder tanks under house for storage of treated water hold up to 11000 litres. Treated water used for toilets and garden, including vegetable garden. Water efficient shower rose – 7 litres per minute. Efficient washing machine – 35 to 55 litres per cycle. Only two mains water taps used: kitchen cold tap & bathroom basin cold tap. Mains water consumption averaged 20 litres per day in 2006. The West Brunswick Sustainable House is a comfortable family home that has been re-fitted or retrofitted to have exceptional environmental performance. Through the use of rainwater and recycled water, mains water consumption is only two and a half buckets per day, or 97% less than the typical Melbourne house. The house is set in a permaculture style garden with over 20 fruit and nut trees, vegetable garden, compost and chooks. The green makeover of our house has happened progressively over time, without any need to renovate or rebuild the house. You can use the Community Portal for questions, feedback or observations relating to this article. This page was last modified 03:03, 12 October 2009. This page has been accessed 33,102 times.